Eco-warriors that are saving the planet one plastic water bottle at a time. Between last Tuesday's Earth Day, Friday's Community Clean up, and today's visit to the Green Living Show, I feel like I am going to burst if I don't preach my eco-sermon to you today. You may not know it from my "enhanced" hair color or the chocolate hidden in my night table, but being green is really important to me...and in some small way, it always has been. Ever since the first time I bought antiperspirant and my mom and I had a fight over aerosol (her) vs. stick (me). I was eleven and I just found out that the CFC's in aerosol cans had contributed to the whole they had just found in the ozone layer. 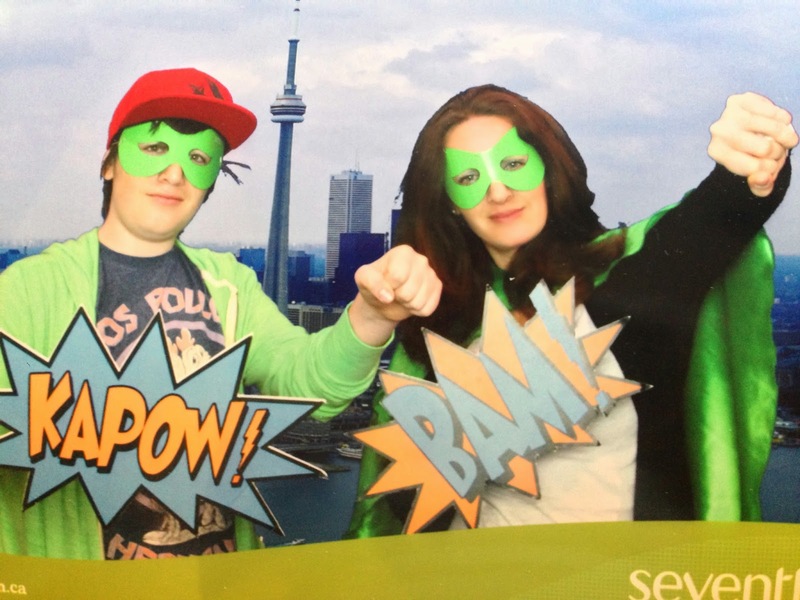 I wish I could say that from that day on, I was the world's greatest eco-hero, but I wasn't. I am proud to say that over the past decade or so, I have slowly been increasing my efforts to make our planet a better place. And by planet, I don't mean the animals, or the trees, or even the air we breath. By planet, I mean us humans. 1. When I was doing my teacher training, I taught the grade 5 science unit: matter and energy. In doing so, I (re)learned that matter cannot be created or destroyed. This means that all of the molecules that are on our planet today have been on our planet since the beginning of time...no more, no less. And with every pop can and plastic bag that goes into our landfill is another billion or so molecules that won't be available to us for 500 years or more. Combine that with the fact that the world population is rising at an exponential rate and it's not hard to see why I started to worry about us running out of molecules. 2. A few years later, the resident eco-expert in my school, Esther Collier, and I were talking and she pointed out that the word environmentalist is deceiving because being an environmentalist really isn't about helping the environment, it's about helping ourselves. She said that she isn't really concerned about helping the planet because the Earth can save itself; it always has and always will. What she does worry about is us humans. That being an environmentalist is really about being a humanist. I wish I could tell you that once I clued into these two facts, I was a changed woman. And in some ways, I am; I can't remember the last time I bought a case of water and I own (and use) a rain barrel. But I am also the first to acknowledge that it ain't that easy. Even though I know its loads better, I can't bring myself to switch from a 10 minute drive to work to a 45 minute bus ride. Nor am I ready to give up meat, fountain pop, or movie theatre popcorn. The small changes I have made, and continue to make, are (hopefully) helping the human race move in the right direction. Changes that are almost effortless, save me money, and in most cases will make both me and our planet happier and healthier. In other words, small changes that make a big difference. 1. When possible, use a fan instead of air conditioning. Did you know that an electric fan uses on 90% less energy than an air conditioner? Besides that, there's something romantic, something very...Cat on a Hot Tin Roof-esque about using a fan on a hot summer night. 2. Unplug small stuff -like toasters, electric kettles, and coffee makers when not in use. Even when turned off, they draw energy. Over times this adds up to tons of wasted electricity and tons more money you have to pay for this wasted electricity. The owner always knows what I want to read. 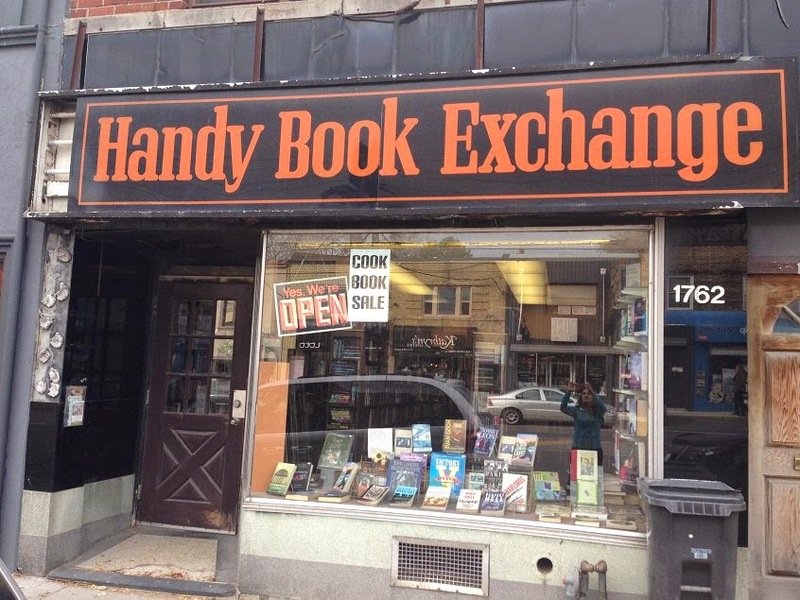 It is a Toronto institution. Please shop here and help keep it open. 3. Read used books. Besides the whole "it's cheaper and better for the environment" thing, I also find that a book given to me from a friend or that I get at my local used book store seems to have a special feel to it. For the past two years, I've hosted a book exchange party for my friends and it is always so much fun. 4. Have a G.O.O.S. (Good On One Side) paper bin next to your printer or on the junk desk in the kitchen. Use GOOS paper whenever you can, especially for you kids' school work or to write notes and lists. You'll go through way less paper and have way less paper in your recycling. As a grade 7 teacher, I don't bat an eye when a student hands in work on GOOS paper. 5. Grow your own food...even a little bit of it. No matter how little space you've got, grow something. It's healthier, it's way cheaper, and it's good for you and the planet on so many levels. I started off with a small herb garden five years ago and now I'm rocking herbs, tomatoes, lettuces, kale, and zucchini. I've even been known to harvest a carrot or two. I promise you that it is way easier and so much yummier than you'd ever imagine. 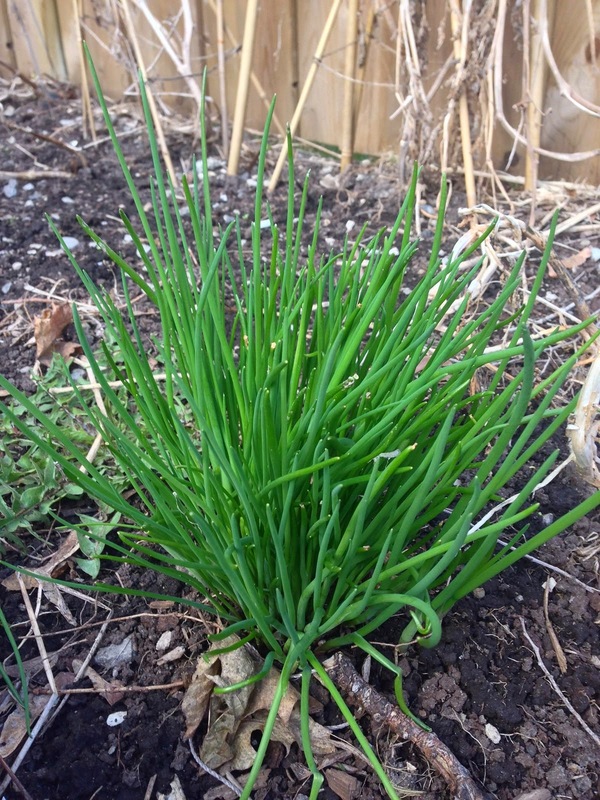 Take these chives for example; even with the most brutal winter ever that seems to be going on forever, these little sticks of heaven have miraculously appeared in my garden and made their 2014 debut performance in tonight's sour cream 'n onion mashed potatoes. 6. Bring you own cup to Starbucks. Not only does it save the cup, lid, and sleeve from going in the garbage (that's right; they're not recyclable), they'll give you a discount on your coffee and it keep your Decaf Americano with Soy Misto hotter for longer, thus protecting your investment. It's a win-win-win situation! 7. Whenever possible, use biodegradable, chemical-free cleaners. I started thinking a lot about this one when I read the label of my (old) all-purpose kitchen cleaner and it said to keep away from food and to rinse all surfaces with water before coming in contact with food. That sorta scared me because it meant that either (a) I had to clean my counters twice, once to get rid of the dirt and then again to get rid of the chemicals, or (b) my kids would be eating chemicals, or (c) I could just stop cleaning altogether. Because my husband wouldn't allow me to go with option (c), I chose option (d): make my own homemade, chemical-free cleaner. I promise you that if you combine a half-cup of vodka with a capful of dishsoap with two cups of water in a spray bottle, you'll have the best granite cleaner. Ever. better than that other stuff. 8. 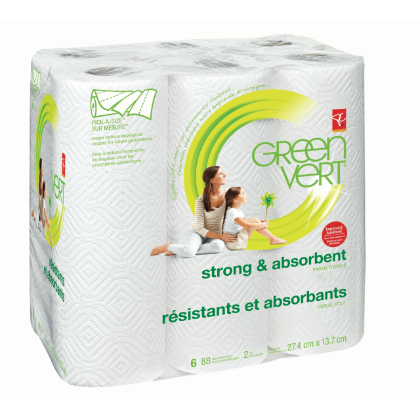 When buying napkins/toilet paper/paper towel, buy napkins/toilet paper/paper towel that is made from recycled paper. Whether its made from recycled or not, paper fibres in those three products are so weak, that they are one of the only kinds of paper that can't be recycled, but rather composted in your green bin. You won't notice a difference in quality when you use the recycled stuff yet you'll be using half the amount of paper. 9. Didn't know that paper towel goes in the green bin? What about plastic shopping bags, do you know where they go? What about tin foil? Are you as surprised as I was to find out that you can recycle plastic bags but not tin foil? Find out once and for all how to junk your junk. I know a ton of people (including my husband) who stuff everything in the recycling bin, thinking that they'll sort it out at the recycling plant. But do you know how much energy that wastes? And did you also know that if the recycling is too polluted with non-recyclables, they just trash the whole thing? For a complete list of how to safely trash your trash, visit Toronto's official what goes where site. 10. Try to eat less meat. Each cow you eat requires at least two acres of land. Those same two acres could produce enough vegetables to get your family through a summer. Thus, as the population on our planet goes up, so do the number of cows needed, which means there is less available land for vegetables and grains. Besides the whole using a whole lotta land thing, did you know that cows fart? A lot? And that in doing so, they produce methane gas, which is 23 times more powerful than carbon dioxide? And that on a daily basis, a single cow produces the same amount of air pollution as a car? Beans may make you fart...but not that much. Besides the whole farting and land thing, eating less meat is cheaper, healthier, and forces you to become a more creative cook and forces your kids to become more creative eaters. Just today I heard from a friend that her son, the world's pickiest eater, ate cauliflower-crust pizza...and asked for seconds! And yesterday, my son independently chose hummus for a snack! Victory! So that's it. Some of the small things I'm doing to try to make this world a little bit better for my kids. But I need help. I can't do it alone. What are your favorite green tips? You could win a gift basket of President's Choice Green Cleaning Products. Post your comments below or the ItsNotThatSerious Facebook page. Disclaimer: I was not at all compensated for this post. President's Choice just generously donated the cleaning products for the contest. My green tip is to take some time On the weekend to plan your meals for the week. Not only does this save multiple trips to the grocery store, I also find I waste less food because I have planned to make better use of the items I purchase. Also, I once heard a tip that you should try to walk anywhere that is under 1 km away. It doesn't always work (I.e., bringing a hot pizza or full load of groceries home), but it does remind me to walk more when it is manageable. And it promotes healthy living for my children.